All that is truly tea comes from the plant Camellia sinensis. Whether it is classified as black, green, or white depends on how it is processed. Chamomile, mint, and other teas are more accurately herbs that can be brewed into teas. 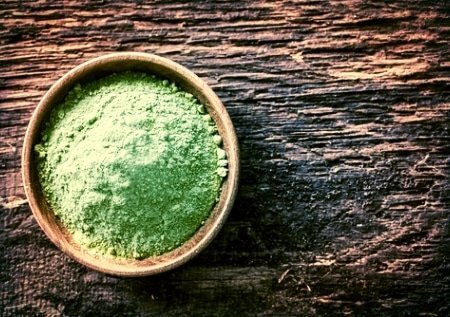 What Makes Matcha Green Tea Special? Green tea is prepared through steaming. This light processing leaves most of its beneficial compounds in tact, making it famously healthy. Matcha green tea is then stone ground and sold as a powder. When you drink matcha green tea, you are consuming the entire leaf of the Camellia sinensis plant, rather than just the essence left over after steeping. Another difference in this type of green tea is the color. Prior to harvesting, plants are covered to block incoming sunlight. Hungry for sun, they begin to produce more chlorophyll in an effort to absorb rays. These chlorophyll-rich plants are thus greener and offer more of chloropyll’s health-giving properties. The youngest, greenest leaves are picked to be steamed and ground into the final product. As we talk about the health benefits of matcha green tea, keep in mind that green tea, and tea in general, provide many of the same benefits. Matcha green tea, since it is a steamed, whole leaf product, is more nutrient dense. Chlorophyll has a very similar structure to hemoglobin, a molecule found in red blood cells that is responsible for transporting oxygen. Because of this similarity, it is believed that eating or drinking chlorophyll can improve red blood cell count and oxygenation of blood cells. Though research hasn't fully proven these claims, chlorophyll is used as a supplement by many to improve health. This word may not look familiar, but you might regularly consume a compound under this classification: caffeine. While caffeine is present in high amounts in coffee, it is less so in tea. Tea also contains two additional types of xanthines: theophylline and theobromine. Theophylline relaxes smooth muscles in the airway, which is why you’ll find it in medications for respiratory diseases. Theobromine has a similar effect on the lungs as theophylline, acts as a diuretic, and can also lower blood pressure by dilating blood vessels. Both theophylline and theobromine are stimulants, but do not provide the same kind of jolt as caffeine. While some do seek that boost from caffeine, these three xanthines in tea provide a more mellow, synergistic stimulation. Catechins are a type of antioxidant known to help trim your waistline. A 2005 study compared two groups who consumed tea over a 12 week period. Group 1 drank tea containing 690mg catechins, compared to Group 2 whose tea had only 22 mg. After the study concluded, participants in Group 1 showed BMI, waist circumference, and fat percentage significantly lower than the control group. This compound in green tea produces calming effects and can improve concentration and memory. A 2006 study presented stressful situations to participants, and those who took L-Theanine showed less heart rate elevation in response to the stress. L-Theanine has been suggested for those with anxiety and people who have a hard time calming down before bed, though it does not induce drowsiness. As previously mentioned, chlorophyll has a very similar structure to hemoglobin; whereas hemoglobin has an iron molecule at its center, chlorophyll has magnesium. Thus, chlorophyll-rich matcha green tea is a good source of magnesium, a mineral involved in the activation of over 300 enzymes in your body. It helps heal wounds and balance cholesterol, promoting an increase in HDL (good) cholesterol. It’s also necessary for bone formation and acts as a natural tranquilizer. In what ways have your health improved through drinking matcha green tea?